Tropical Cyclone Chapala is poised to make an unusual landfall on the Arabian Penisula over the weekend. The Suomi NPP VIIRS Day Night Band Imagery (courtesy William Straka, SSEC/CIMSS), above, from 2102 UTC on 29 October, shows a compact storm with curved bands of strong convection around an apparent eye. A more zoomed-in version of the storm in the infrared (A Zoomed in version of the Day Night band is here), shows very cold cloud tops. Data from the CIMSS Tropical Page shows the environment in which Chapala strengthened will become progressively less favorable as the storm approaches land. The MIMIC Total Precipitable Water, above, shows the storm with dry air to the north and west. 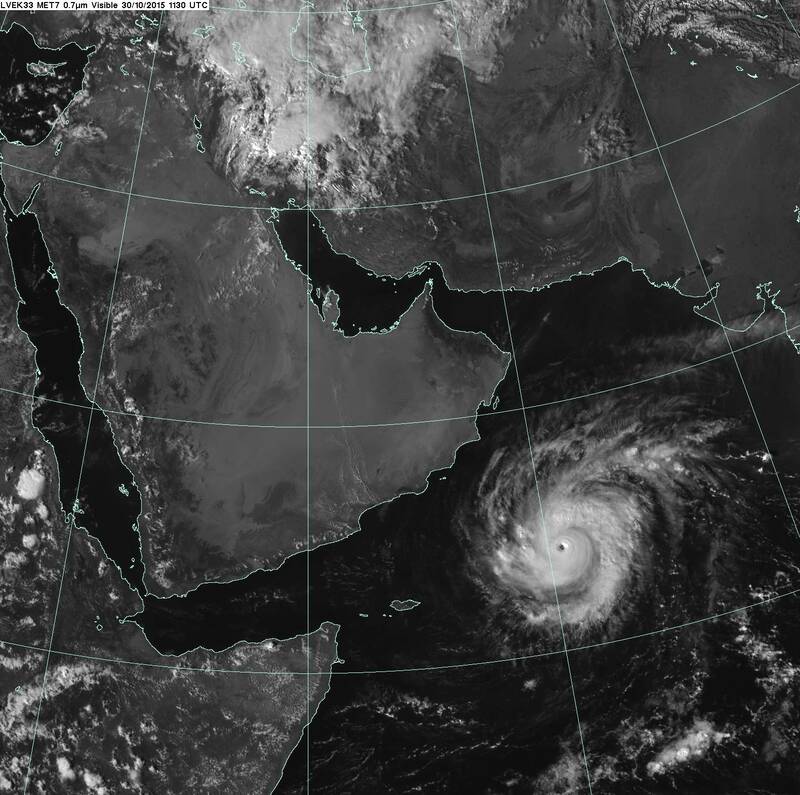 Tropical cyclones that approach the Arabian peninsula are rare. Those that do approach are invariably weakened as they ingest the dry air that is typically over Arabia. Diagnostics of wind shear also suggest that Chapala is moving towards a more highly sheared environment. Microwave imagery, below, shows a very intense eye around 0100 UTC on 30 October. After that time, however, the eye becomes less distinct. Data from the Indian Satellite Kalpana-1 (data courtesy of the Indian Space Research Organization) shows a peak intensity — as measured by the warmest pixel in the eye — occurred around 1015 UTC on 30 October 2015. The warmest brightness temperature warmed 15 K between 1015 UTC and 1345 UTC. Meteosat-10 viewed the storm as well, and all 11 channels from 0300 to 1500 UTC, including 0600 and 1200 UTC, are shown below. The water vapor channels, in particular, show the very dry air over the Arabian Peninsula. In addition, the animation shows gradual warming of the coldest cloud tops. Data from Meteosat-7, (source) viewing the Indian Ocean, shows the rapid intensification of this small storm. (See also this Meteosat-7 Visible imagery courtesy of the British Met Office). See also this blog post on this rare event. Cyclone Gonu in 2007 also affected the Arabian Peninsula (and Iran). The toggle below shows Meteosat-7 imagery of the two storms near their respective peak intensities (Chapala’s intensity plot with time is shown here). Gonu was a far more symmetric storm with more expansive cold clouds tops, but the overall sizes of both storms were similar. INSAT-3D viewed the storm as well. The near-infrared 0.86 µm imagery, above, highlights the land-sea differences very well as well as showing a compact eye. A Suomi NPP VIIRS true-color Red/Green/Blue (RGB) image of Cyclone Chapala is shown below. GOES-15 (GOES-West) Infrared (10.7 µm) images (above; also available as an MP4 animation) displayed the formation of a ring of cold eyewall cloud-top IR brightness temperatures (in the -80 to -90º C range, violet colors) during the period of rapid intensification of Hurricane Patricia on 22 October 2015; the storm reached Category 5 intensity around 00 UTC on 23 October. Patricia then continued to intensify, reaching maximum sustained surface winds estimated at 175 knots with a minimum central pressure of 878.4 hPa or 25.94 inches of mercury (making this the strongest tropical cyclone on record for the National Hurricane Center area of responsibility, which is the North Atlantic Ocean and the eastern North Pacific Ocean). The storm weakened somewhat prior to making landfall (although still as a Category 5 hurricane) around 2315 UTC on 23 October. Multi-day YouTube animations showing the formation of Patricia are available here (0.63 µm visible imagery from GOES-13) and here (10.7 µm infrared imagery from GOES-13). The multi-day location of Patricia’s 850 hPa relative vorticity signature (derived from satellite atmospheric motion vector data) can be seen here. A plot of the Advanced Dvorak Technique intensity estimate (below) showed the rate of rapid intensification on 22-23 October. At one point Patricia’s central pressure deepened 100 hPa in 24 hours, and 73 hPa in 12 hours, making it the fastest-intensifying tropical cyclone on record in the Western Hemisphere. GOES-15 Visible (0.63 µm) images (below; also available as an MP4 animation) revealed the small “pinhole” eye of Patricia during rapid intensification on 22 October. As Patricia was rapidly intensifying from a Category 1 to Category 5 intensity, the tropical cyclone was moving over a region of high Ocean Heat Content (below), and Sea Surface Temperature values were as high as 31º C.
A comparison of Suomi NPP VIIRS Infrared (11.45 µm) and Day/Night Band (0.7 µm) images at 0741 UTC on 23 October is shown below (courtesy of William Straka, SSEC). With ample illumination from the Moon (which was in the Waxing Gibbous phase, at 78% of Full), the “visible image at night” capability of the Day/Night Band provided a detailed view of cloud-top gravity waves surrounding the eye. A later VIIRS Infrared (11.45 µm) image at 0920 UTC is shown below. A comparison of GOES-15 (GOES-West) and GOES-13 (GOES-East) Visible (0.63 µm) images (below) showed the eye of Patricia from sunrise on 23 October until landfall along the west coast of Mexico around 2315 UTC. A mesonet station at the Chamela-Cuixmala Biosphere Reserve (located approximately 10 miles northwest of the eye landfall position) reported maximum sustained winds of 185 mph at 2350 UTC, with a peak wind gust of 210.9 mph at 2310 UTC. MIMIC morphed microwave imagery (below) showed the development and motion of the very compact eye during the 22-23 October period. There was also a signature of the formation of a secondary outer eyewall, suggesting that an eyewall replacement cycle was underway as Patricia was approaching the west coast of Mexico. View a 23 October weather briefing held at CIMSS to discuss Hurricane Patricia here. Following the landfall of Patricia late in the day on 23 October, and increase in offshore sediment could be seen in Suomi NPP VIIRS true-color Red/Green/Blue (RGB) images (from the RealEarth web map server) on 24 and 25 October (below), a result of runoff from heavy rains inland.